A new beta version of HDSDR has recently been released. HDSDR hasn’t been updated since 2013, so it is good to see that the author is back in action. 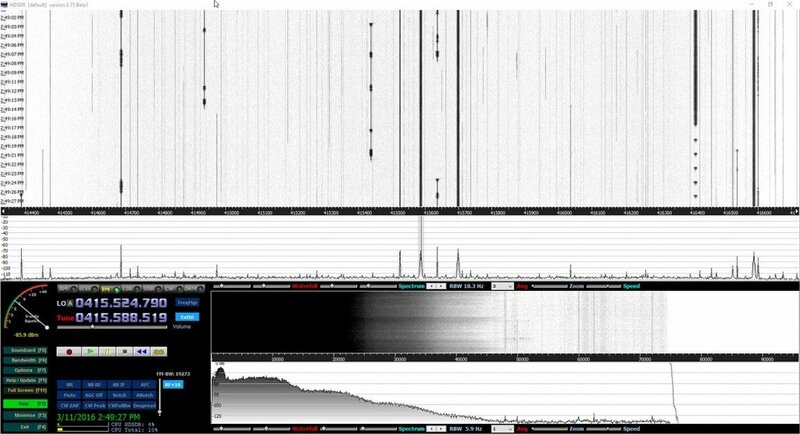 HDSDR is a free general purpose SDR receiver, similar in nature to other programs like SDR# and SDR-Console. It was one of the first programs to work with the RTL-SDR dongle and despite a lack of recent updates is still a very solid piece of software. The main visual difference we’ve noticed so far is the addition of a text dBM meter under the S-Units meter. We also discovered some new color palettes. HDSDR Beta running a new bright grayscale color palette. Does it have a Frequency Manager and Scanner Plugin like SDRSharp and can you pipe a signal to any version of DSD. The homepage of HDSDR says “Frequency Manager for Eibi, Ham Bands, Radio Bands, User frequency lists”, but i’ve never managed to use it. Yes you can pipe audio just like in HDSDR. HDSDR is my goto app for sdr so far, very low cpu utilisation and it just works with everything and is easy to use and very intuitive. My only dislike is it’s kinda cartoonish in looks with the s meter and so on, also it’d be nice to get rid of the lo display and have just one large tuned vfo display instead but that’s just me. I would like to start out by saying that I have used HDSDR for a few years now and like it . Now for the beta version . The first that I noticed was that I had to turn the volume up . The other thing is that noise floor is lower at S four , the old version the noise floor ran at S five . As I play with the beta version I will post more . I forgot to say that I was using a V3 dongle with a MFJ 1020C in front of and a long wire antenna . Also this is what I saw on HF , I haven’t tried VHF or UHF yet . I remember writing to the author and requesting the 8-bit recording feature almost a year ago on November 30, 2015. I didn’t think he was still working on this. It’s great because now there’s little reason to use the CPU-hungry SDR#. However, I noticed that when I stop an IQ recording from playing, it seems to switch to a weird sound card input mode.